Helperic and Bede were the main sources of information about such matters as how to calculate the movable date of Easter. This manuscript, which was owned by the abbey of St. Albans by the early 13th century, was very possibly copied from another manuscript now at the British Library (Royal MS. 12 D.iv), which was written c.1100 at Christ Church, Canterbury. 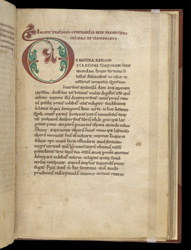 The start of the prologue of Bede's treatise 'De temporibus' is marked by a heading in red capital letters and a simple yet elegant two-colour initial.